I didn’t actually plan on booking a trip to Berlin. It was one month before Miguel’s flight back to the Philippines, I already started to feel that I would definitely get sad when he’s gone. I didn’t want to go back to an empty apartment—I thought. So, why not book a trip somewhere since both of us will be at the airport then? I didn’t think this through; I originally wanted to visit a country that’s close to Sweden, but I stumbled upon a blog that Berlin is one of the cheapest destinations in Europe. I checked the flight tickets from Skycanner, and the flight to Berlin only cost me around 300+ SEK ($ 34). Since it is so cheap, I also booked a front-row seat so I can bring two hand-carry items. Berlin has a lot to offer; in fact, I probably visited more places in Berlin than in Stockholm. I guess that’s because Stockholm is already my city, and I didn’t have the urge to explore it more. Aside from work on weekdays, I am too lazy to go outside my apartment on weekends. Plus, it was cold for the past few months! When I am reading blogs about where to stay in Berlin, I found this post from The Broke Backpacker helpful. It was explained there which neighborhood in Berlin you should stay. She recommended that Mitte neighborhood is good for first timers in Berlin, so I booked my accommodation in that neighborhood. I arrived in Berlin late at night, so I only had one and a half day to fully explore the city. I didn’t have an itinerary; I thought I should just explore the city without any itinerary to follow. Besides, every place is accessible because Berlin has different transportation options: S-Bahn, U-Bahn, buses, trams, and ferries. Everybody probably knows this landmark, and everybody has a picture here, of course! 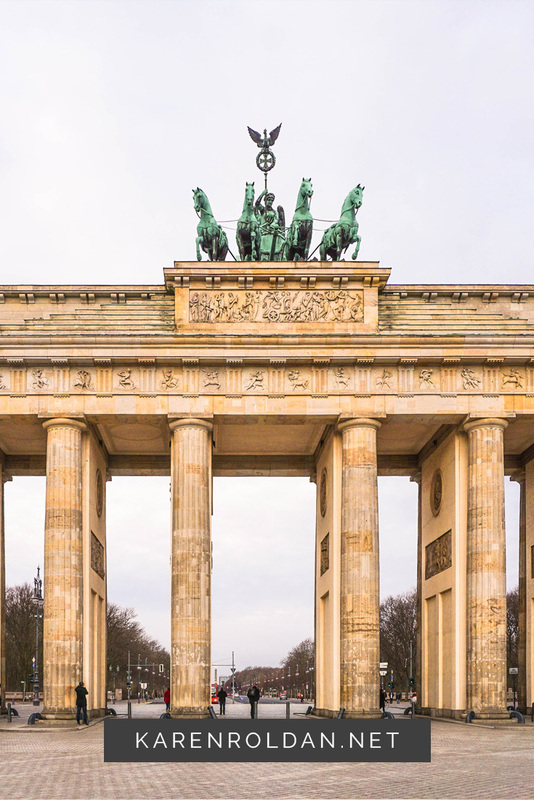 The Brandenburg Gate used to be a symbol of division in Germany, but now it is Berlin’s symbol of peace and unity. Only 6 minutes walk from the Brandenburg Gate is where you can find the Reichstag Building, the home of the German parliament. It is advisable that you plan ahead and book online to enter the building and the dome, so you don’t have to wait and queue that long. This place is called memorial to the murdered Jews of Europe—also known as The Holocaust Memorial—which means you have to respect the place. I hope you’re not like those tourists who enjoyed taking a selfie or making this the backdrop for their Instagram photos. If you are familiar with the picture of the East German soldier who jumped over the barbed wire after the division of Berlin, then this Berlin Wall Memorial is where it all happened. Anyway, these are my favorite places that my friend and I visited. We visited these places in one day, and I went to Kreuzberg on my last day in Berlin.